Thérèse Raquin was Zola’s first big success, and judging by the publicity promising splendides illustrations presumably as racy the one on the poster, the good folk of Paris were under no illusions about the novel. Sales were helped along, no doubt, by outraged criticism in Le Figaro by ‘Ferragus’ who called it ‘putrid literature’. According to the introduction by Andrew Rothwell, the translator of this new edition from Oxford World’s Classics, Ferragus was the nom de plume of author Louis Ulbach and there is some suspicion that Zola put him up to it so that he could generate further interest in the novel by writing a rebuttal. (All publicity is good publicity, eh?) 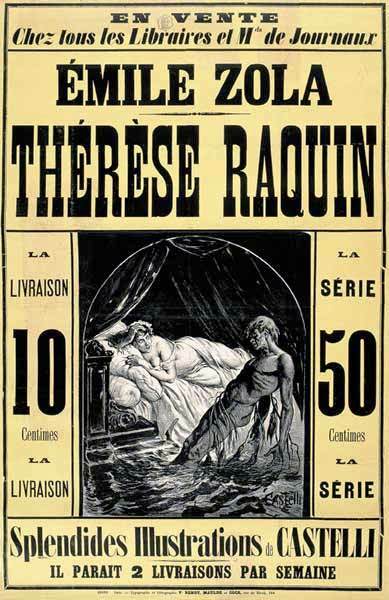 For the good folk of the 21st century, however, inured as we are to unhealthy preoccupation with lust, corpses and decay, Thérèse Raquin isn’t regarded as disgusting and immoral … and … an outrage against good taste. Rather, it’s regarded as a milestone in the development of Zola’s ambitions to use fiction to comment on society. All well and good, but how does it read on its own terms? Well, it limps a little towards the end, but it’s still a powerful evocation of the psychological effects of guilt. Like Dostoyevsky’s Crime and Punishment it explores the mental anguish arising from murder, showing how the adulterous couple Thérèse and Laurent can never realise the happiness they hoped for because they are tormented by guilt. Zola paints their claustrophobic mental state in a gloomy, morbid Paris. The Raquins live in an apartment above their haberdashery in a narrow, dark arcade, paved with yellowish flagstones, worn, uneven, permanently exuding an acrid-smelling damp and covered by a right-angled glass roof black with grime. It gets a pallid light in summer, but on foul winter days or foggy mornings, the glass casts nothing but darkness on the sticky flags beneath, a vile and murky darkness. (p. 7) The central characters are held captive in this dingy atmosphere with only a few other equally lugubrious settings: the murky Seine, where the murder takes place; Laurent’s dismal workplace and grubby studio; and most repulsive of all, the morgue. There are very few characters – only old Mrs Raquin; her doomed son Camille; her niece Thérèse and her opportunistic lover Laurent; and the Thursday night visitors to the house: Grivet, an ancient employee who works with Camille; and the dim-witted police commissioner Michaud, his son Olivier and daughter-in-law Suzanne. (Oh yes, there is also the Raquins’ cat called François, which is imbued with vengeful behaviours by Laurent. But I thought it just behaved like a typical cat.) Consistent with Zola’s beliefs about temperament defining behaviour, the adulterous couple behave as their smouldering amoral passions dictate, and they do not change, which tests the tension and the realism that the novel aims to achieve. The reader knows that they are doomed, it’s just a question of how Zola resolves their fate. The novel works despite its limitations because Zola is such a brilliant wordsmith. He elicits a sense of shocked awe in the reader when Laurent and Thérèse hatch their plans. Laurent’s obsessive visits to the morgue are revolting. Camille’s constant presence in the couple’s fateful marriage is palpable, and the horror of old Mrs Raquin’s impotent discovery of their duplicity is unforgettable. 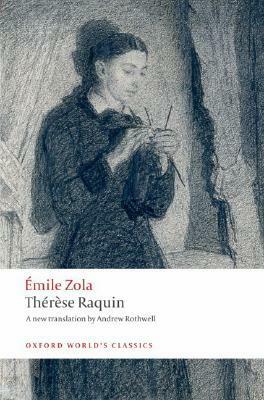 Thérèse Raquin is gripping reading, all the more so because for all its flaws it heralds Zola’s mastery of the French Naturalist Movement.